The Works Progress Administration and the Civilian Conservation Corps built the Walhalla State Fish Hatchery (WSFH) in the 1930's. In 1996, supervision of the hatchery was transferred from the U.S. Fish and Wildlife Service to the South Carolina Department of Natural Resources. 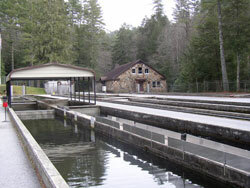 The WSFH is the only cold water fish hatchery operated by the SCDNR. Funding for the operation of the Hatchery is provided by Duke Power, U.S.Corp. of Engineers, Sport Fish Restoration (Federal Aid), and revenue from the sale of fishing licenses. The hatchery is staffed by a fisheries biologist, three technicians, and one part-time employee. WSFH raises brown, brook and rainbow trout for stocking the public waters of South Carolina. Most of the trout are cultured to a catchable size of 9-12" before they are released. Fingerling trout are also produced to enhance the trout fishery. Approximately 500,000 trout are produced and stocked annually by the WSFH. Very large trout (5-15 pounds) are also kept at the Hatchery on display for the public viewing enjoyment. The Walhalla brochure is provided in the Adobe PDF file format. Adobe® Reader® is required to open the above files and is available as a free download from the Adobe® Web site.